BITCOIN WARNING! How Bitfinex, Tether risk crashing global crypto markets. (Bloomberg) — Among the many mysteries at the heart of the cryptocurrency market are these: Does $814 million of a digital token known as tether really exist? And what is tether’s connection to Bitfinex, the world’s biggest bitcoin exchange? This is the state of crypto in late 2017, where questions about the companies behind the currencies are multiplying with the profits. While cryptocurrencies appeal to people who lack faith in governments and banks, the digital assets often require a blind trust in companies about which few facts are available. Take tether. The currency, which started trading in 2015, is described as a stable alternative to bitcoin’s wild price swings. A restaurant owner who accepts bitcoin but fears its volatility could shift bitcoin into tether, which can be easier to do than exchanging bitcoin for dollars. Its price has stayed near $1 for most of its life because Tether, the company behind the digital token, says that every tether is backed by one U.S. dollar held in reserve. Since there’s $814 million of tether circulating, there should be $814 million parked in bank accounts somewhere. Not everyone believes there is. Little public information exists about how tether is created, fueling questions, said Barry Leybovich who creates risk and compliance products for financial institutions interested in blockchain applications. The market believes that each tether is worth $1, even if they’re not actually backed by that money, and trades of tether for bitcoin at Bitfinex are helping drive up the price of bitcoin, he said. On Dec. 2, Bitfinex released a quarterly report announcing it would no longer serve U.S. customers because it’s too expensive to do business with them. This followed Wells Fargo & Co.’s decision earlier in the year to end its role as a correspondent bank through which customers in the U.S. could send money to Bitfinex and Tether’s banks in Taiwan. Bitfinex and Tether filed suit against Wells Fargo, but later withdrew the case. Bitfinex and Tether identified four Taiwanese banks in the Wells Fargo lawsuit. However, Ronn Torossian, a spokesman for Bitfinex and Tether, refused to identify their current banks unless a reporter signed a non-disclosure agreement, an offer that wasn’t accepted. Documents posted online show Bitfinex directing prospective customers to Poland’s Bank Spoldzielczy in Skierniewice. Torossian wouldn’t comment on whether the documents are authentic. Wladyslaw Klazynski, the bank’s chief executive officer, wouldn’t confirm if any accounts have been opened by Bitfinex clients, citing Polish financial law that forbids revealing client data. “We are in touch with the Polish financial market watchdog in order to explain media information” about the situation, he said in a phone interview, adding that his firm isn’t “financially engaged” with any company trading bitcoin. Neither Tether nor Bitfinex disclose on their websites or in any public documents where they’re located or who’s in charge, but information is available elsewhere. Jan Ludovicus van der Velde is CEO of both Bitfinex and Tether, Torossian said by email on Dec. 3. A LinkedIn page for someone named J. L. van der Velde, who identifies himself as Bitfinex’s CEO, says he speaks Dutch, English, German, Italian and Chinese, attended National Taiwan Normal University from 1985 to 1988 and was previously CEO of PAG Asia Inc.
Phil Potter is a Tether director, according to documents — dubbed the Paradise Papers — recently leaked by the International Consortium of Investigative Journalists. He’s also the chief strategy officer at Bitfinex. A graduate of Yale University, Potter worked as a derivatives analyst for Morgan Stanley and then moved to the private client services unit at Bear Stearns Cos., where he worked on technology infrastructure and software design. He’s given many interviews that can be found on YouTube, including Q&As after Bitfinex was hacked last year. Bitfinex incorporated in Hong Kong in 2013, but then changed its name to Renrenbee Ltd. a year later, according to Companies Registry in Hong Kong. Giancarlo Devasini is listed as a director at Renrenbee by Companies Registry. He’s identified as a Tether director in the Paradise Papers. Torossian said van der Velde, Potter and Devasini weren’t available for interviews. He said that in early November he tried to cash out $1 million of tether, a request Tether refused. 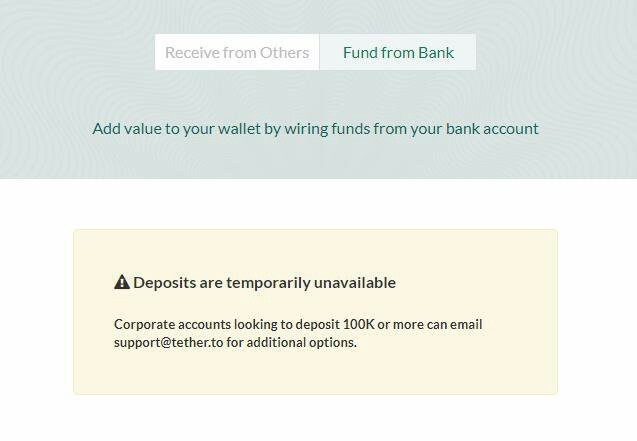 “Due to ongoing banking difficulties we are only able to process requests for verified corporate customers,” Serdar was told by Tether, according to emails he shared with Bloomberg News. Serdar said the company stated that its currency was backed by reserves, meaning it was one of few places to exchange tethers for dollars, and while he didn’t have an account he approached them to find out who they banked with. Serdar “doesn’t have any money with us and he never did,” Torossian said. “The customer in question was flagged as suspicious because of numerous irregularities,” he added. “If this customer wishes to complete our KYC process properly, we may review this matter further. Until that time, this individual will not be permitted to do business with us,” he said, referring to know-your-customer regulations that require financial firms to vet their clients. On Dec. 3, Bitfinex said it had hired law firm Steptoe & Johnson LLP because of “false claims and related activity by various parties,” according to an emailed press release. “To date, every claim made by these bad actors has been patently false and made simply to agitate the cryptocurrency ecosystem,” Stuart Hoegner, counsel for Bitfinex, said in the statement. The Bitfinex Dilemma: Blow up now, or try a Hail-Mary to retain in business. By Bitfinex’d, posted on Medium. In my last post, I mentioned how Bitfinex essentially started a ponzi scheme in order to pay back their BFX tokens. Read more: Bitfinex never ‘repaid’ their tokens, Bitfinex started a ponzi scheme. In this post, I’m going to look at things a little bit from the side of Bitfinex of the choices they had, and this may help explain their rational for committing fraud on a wholesale scale while sending their trolls out to try and gaslight me. 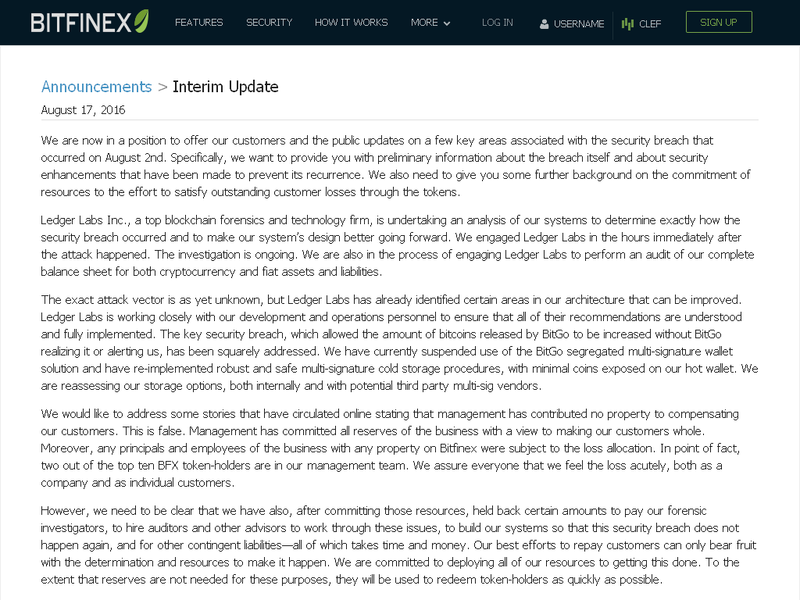 If you recall, Bitfinex was hacked and lost 72 million dollars of their customers money. They slowly paid back a small percentage of these with ‘real money’. Their main scheme was to pay these back by selling equity in Bitfinex to people holding their debt tokens. Bitfinex themselves admitted it would take several years to pay these back normally. Let’s set aside for a moment that their valuation had no basis in reality due to non-existent (but promised) audits and wash trading (bitfinex based their valuation on income derived from trading fees, but includes wash trades in these numbers). They sold roughly (as far as I know), around 50 million in equity. The rest of the BFX tokens were paid back with Tethers. On April 3rd, 2017, just two days before Bitfinex was about to file a major lawsuit against Wells Fargo (which bitfinex admitted was frivolous), they announced that they had ‘paid back’ all of their tokens. Just as they said they ‘paid back’ their tokens, Wells Fargo, the last bank willing to process their transactions, cut off all services on March 23rd. Bitfinex essentially had the rug swept up from under them. An exchange is completely dead without banking. It’s a water park with no water. A movie theater with no movies. A peanut butter jelly sandwich with no peanut butter or jelly. A nothingburger. They essentially had two options. Option 1. Shut down the exchange until they re-establish banking, process USD withdrawals via their “settlement” setup with their lawyers. Shareholders go into panic mode, lose market share to legitimate exchanges, end result, exchange dies, shareholders who converted their debt to equity… bag holders. Option 2. Fraud. Start artificially inflating the price of bitcoin to influence a mania while trying to re-acquire banking, ensure that the price of Bitcoin NEVER falls so that new money is always trying to come into the exchange and they can process some withdrawals to keep some people happy. Use any means possible to ensure prices never fall. WAIT A MINUTE YOU JUST SAID THEY HAD NO BANKING! WHAT DO YOU MEAN?! If the price of bitcoin is always rising, people always want to deposit money to the exchange. 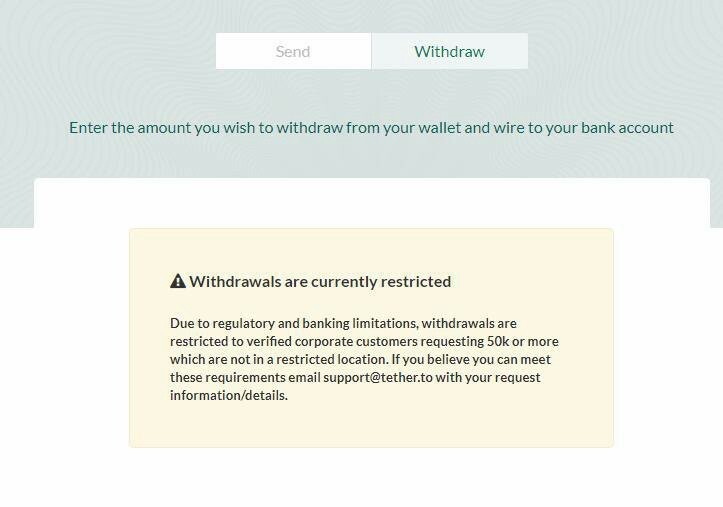 Bitfinex currently admits that ‘large corporate’ accounts can deposit and withdraw, and they require you to jump through a bunch of ‘hoops’ in order to do this. Enter Hawala banking. I highly suspect that this is likely one of the many tools Bitfinex engages to remain in business. As Bitfinex is not exactly honorable when it comes to banking arrangements, as they once claimed that they would play cat-and-mouse tricks with banks by continuously creating shell companies every time their accounts were shut down. Now, say for some reason you want to deposit money to Bitfinex, let’s say… $5 million dollars. Bitfinex has a customer that wants to withdraw $2 million, and another that wants to withdraw $3 million. Bitfinex essentially match-makes you with someone wanting to withdraw from their exchange, and you send the money directly to the other party withdrawing. Bitfinex isn’t in the middle of this transaction at all. Banking is immune to shutdown because neither party is Bitfinex or blacklisted. So in this case, to deposit $5 million to Bitfinex, please send Alice $2 million, and Bob $3 million. Once Bitfinex confirms that the money was sent, they internally adjust the accounts by removing $5 million from those two accounts, and crediting you $5 million. Bitfinex could also queue up deposits for handling withdrawals. For example, say you want to deposit $5 million to Bitfinex, but Bitfinex doesn’t have any large pending withdrawals. In theory, you could sign an agreement to pay them $5 million. You retain control of the money, they credit your account $5 million while you still have possession of the funds. Then, when they are ready, they’ll ask you to pay out Janice who wants to withdraw $2 million, you send the $2 million to Janice and Bitfinex simply gives you a receipt that you paid them $2 million. Well, there’s a problem. This requires a never ending stream of money coming into the exchange. So, the only choice Bitfinex has, is to relentlessly manipulate the price of Bitcoin up for as long as possible so that people always want to deposit, until they are able to re-establish a legitimate banking partner. I don’t believe that Bitfinex expected it to take so long to re-aquire banking. Phil Potter originally said it would be a few weeks. However, it has been 7 months with no resolution to their banking problems. It’s my personal opinion, they will never re-establish banking relations allowing them to function normally. No Bitcoin exchange that has been cut off from formal real-fiat banking for 7 months, has ever survived. Also, let’s not forget the last time we had a Bitcoin exchange with no banking, we had quite a bubble. Especially when they were printing fake money to buy Bitcoins. And well, that’s exactly what we have going on now. Hundreds of millions of fake money masquerading as US Dollars propping up all crypto markets. Tether has never redeemed a single Dollar, as issuance always rises and never falls. In theory, Tethers should be going up and down in market cap as people deposit and withdraw from it. But the reality is, nobody can withdraw. They really want people to believe that someone has bought 550* million worthless Tethers for a product that doesn’t even work. *I suggest not using the dollar sign ($) when referring Tethers, as Tethers are not money, not redeemable. They are car wash tokens. 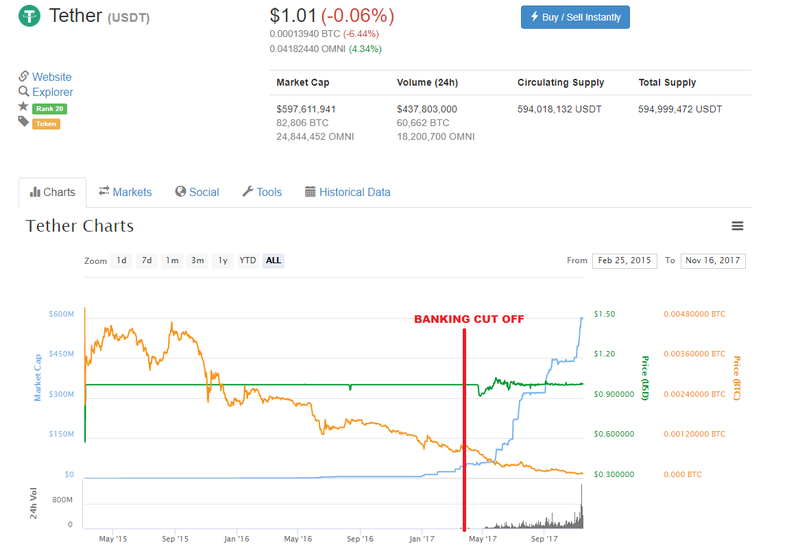 One possible theory for the issuance of Tethers is Bitfinex/Tether themselves are borrowing money from a bank, using these on the margin markets to earn a higher return than their interest rate they borrow at. Under these circumstances it would make sense, and the risk to the bank is minimal, because Bitfinex never has to withdraw the funds from their bank. I would argue that if you went to a bank, asked to borrow $500 million, and pay them 5–10% APY interest, on top of never withdrawing the money from your account, a bank might be willing to play ball. They could also speculate on the price of Bitcoin with these tethers, even if their positions crash in value… the money is still in the account and they can prioritize the bank prior to their depositors. But then it does mean that everyone holding a Tether is in a sense, holding a liability that Bitfinex/Tether has to their bank. Not to mention they could show their terms of service to their bank and say well “Look, we don’t ever redeem these Tethers anyway”. THIS IS ALL FUD (Fear, uncertainty and doubt)! AUDIT WILL MAKE YOU LOOK STUPID! Let’s go back in time. Bitfinex announced they engaged “Ledger Labs” to do a full financial audit, including their liaiblities. In April 2017, Bitfinex admitted that they never actually engaged the auditor, “Ledger Labs”. Despite the simple fact that Bitfinex, never engaged Ledger Labs, traders and customers were informed that the audit was progressing as late as February 2017. 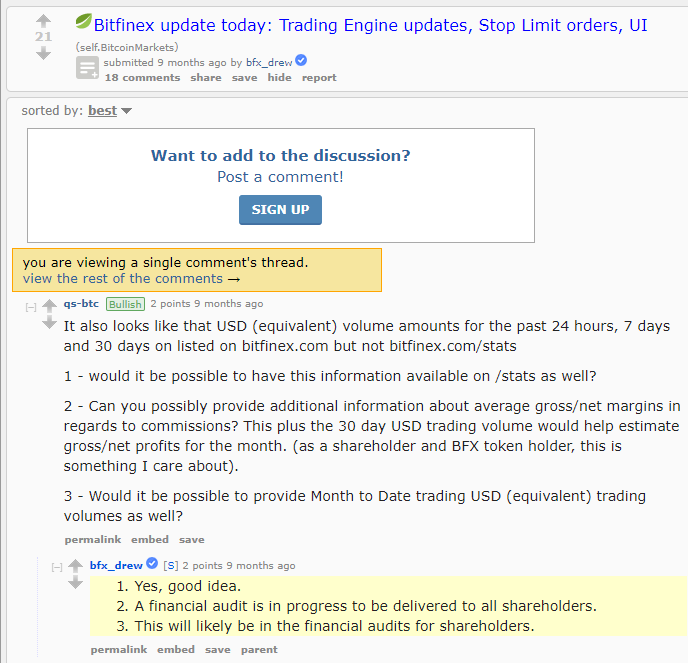 What has Bitfinex been saying about their audit since April of this year? How many times can they lie to their customers, and get away with it? I’d argue an audit is not coming. Ever. If they release anything, it will be another ‘management report’ full of disclaimers by Friedman LLP that render the document worthless. Bitfinex had two terrible options before them. They either shut down due to no banking, causing catastrophic losses to their new shareholders who just took a big chance with them, or they try to inflate a bubble, and hope it gets big enough so that they can at least pay back their shareholders and well, screw everyone else. I’d argue they took the latter option. Because with fraud, at least there’s a chance they get away with it due to the unregulated nature of Bitcoin, and well, every time someone tries to call them out on their scam they are able to send in their trolls to quell any sort of outrage. At least until I came along as I refuse to back down and drop the subject, as they have been conducting fraud since the very start of their exchange. I intend to succeed where they failed, by persistently telling people the history and the truth of this exchange. Sooner or later, the truth always comes out. Let’s not forget that time where the Chief Financial Officer Giancarlo Devasini, of Bitfinex was credited a million dollars he did not have on deposit, to trade with.